With the Poultry Project’s October 10 Chicken Coop Design Competition deadline fast approaching I thought I’d take the time to remind folks to get those submissions in and provide a little inspiration for those of you struggling to come up with a creative idea. The coop pictured here was designed by Michael Thompson using half of a dead 1970 Morris Traveler, a vehicle designed by Britain’s Morris Motor Company (no worries, you won’t be competing against Thompson’s coop in our competition). This baby is pretty slick and proof that possibilities for a really creative design are limitless. 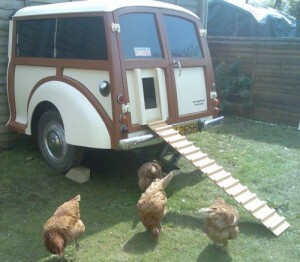 More photos of Thompson’s design are available at http://www.backyardchickens.com/web/viewblog.php?id=16313-maurice-chicken-coop-car. For further information regarding the Poultry Project’s Chicken Coop Design Competition please go to http://www.poultryproject.com/news-events/events. We anxiously await your submissions and appreciate your support and participation in the Chicken Coop Design Competition.